Currently, cats are the most popular domestic animals. They even outnumber dogs in United States households. Even though many of us are cat-lovers, these facts about cats may come as a surprise. Cats step with both left legs, then both right legs when they walk or run. The only other animals to do this are the giraffe and the camel. Ernest Hemingway once had some 30 cats at his home in Havana. Many of them had six toes on each foot. In 1888, an estimated 300,000 mummified cats were found at Beni Hassan, Egypt . They were sold at $18.43 per ton, and shipped to England to be ground up and used for fertilizer. In ancient Egypt , the entire family would shave their eyebrows off as a sign of mourning when the family cat died. In the midst of building the Grand Coulee Dam in the state of Washington , engineers were stymied by the problem of threading a cable through a pipeline until an anonymous cat saved the day. Harnessed to the cable, this unknown hero crawled through the pipeline maze to successfully finish the job. Orange and lemon rinds are offensive to cats. A light rubbing of orange peel on furniture will discourage your cat from using it as a scratching post. Sir Isaac Newton, who first described the principle of gravity, also invented the swinging cat door for the convenience of his many cats. The average canned or dry cat meal is the nutritional equivalent of eating five mice. More cats are left handed than right handed. Out of every 100 cats approximately 40 are left-pawed, 20 are right-pawed, and 40 are ambidextrous. The ridged pattern on a cat’s nosepad is as individual as a human fingerprint. At their fastest, cats can run at 30mph. Cats perspire through their paws. Cats breathe at a rate of 20 – 30 breaths per minute. Cats can jump 5 times their height. 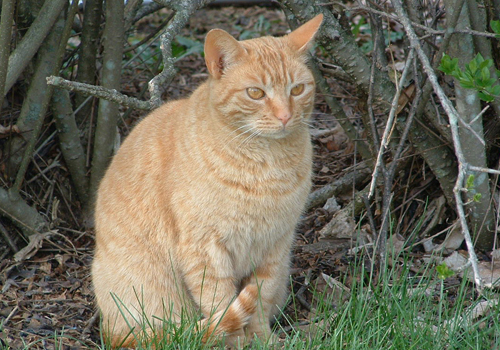 The average outdoor only cat has a lifespan of about three years. Indoor only cats can live sixteen years and longer. Whiskers are very sensitive, even to small changes in air currents. A cat has four rows on each side of its face. The upper two rows can move independently of the bottom two rows. A cat usually has 12 whiskers. They are used as “antennae” to tell if a space is wide enough to squeeze through. The top two rows of a cat’s whiskers can move independently of the lower two rows. This allows maximum perception of the cat’s immediate surroundings. Both humans and cats have identical regions in the brain responsible for emotion. In Japan, there is a myth that cats have the power to turn into super spirits when they die. Possibly because according to the Buddhist religion, the body of the cat is the resting place (temporary) of the soul of very spiritual people. A cat sees about six times better than a human at night because of the tapetum lucidum , a layer of extra reflecting cells which absorb light. Ever notice how rough your kitty’s tongue is? The cat’s tongue is covered with backward facing hooks (papillae) that are used to groom its fur and to scrape meat off bones. Want to know your cat’s age in human years? At one year of age, kitty is the equivalent of a fifteen year old human. At two years of age, kitty is equal to a twenty-four year old human. For every year after that, add four. So, an eight year old kitty is equal to a forty-eight year old human!! An estimated 50% of today’s cat owners never take their cats to a veterinarian for health care. Too, because cats tend to keep their problems to themselves, many owners think their cat is perfectly healthy when actually they may be suffering from a life-threatening disease. Therefore, cats, on an average, are much sicker than dogs by the time they are brought to your veterinarian for treatment. Recent studies have shown that cats can see blue and green. There is disagreement as to whether they can see red. A cat’s hearing is much more sensitive than humans and dogs. The cat’s tail is used to maintain balance. Blue-eyed, white cats are often prone to deafness. The cat’s front paw has 5 toes and the back paws have 4. Cats born with 6 or 7 front toes and extra back toes are called polydactl. Cats scoop water up backwards with their tongue when they drink. I hope these trivia bits will help you enjoy these fascinating creatures even more than ever!